Tom Winkler vowed to his wife last year that it would be his final London marathon after the birth of his twin girls. Thomas is also running Manchester marathon this year too. 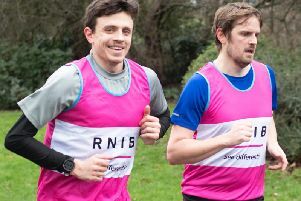 As well as preparing to run 26 gruelling miles, account manager Tom, 29, of Abington, is hosting a quiz night at the Smoke Pit on April 14 to help him reach his fundraising goal. He was inspired to start running after his mum, Karon, passed away in 2014. Karon beat breast cancer before it returned again and spread to her lung and liver - at the very same time she was battling a growth in her brain. Tom and Karon worked together at Nationwide and Tom was asked if he wanted to take up one of the two race places the bank had to run the London marathon. After jokingly being told he would not be able to manage it as he had no previous running experience, he stepped up and started training hard. He said: "At that point, I did not run or do anything but my mum was the only person who said 'you can do it'. "I got the place in October and she passed away in November. My mum was in work three weeks before she passed away and never had a day off sick. "When I have been on long runs, I'm feeling rubbish and think 'why am I doing this'? I hear my mum's voice in my head. My mum told me to get it done and that's what I'm trying to do now." If you would like to donate to Thomas' JustGiving page click here.